To Be or Not To Be: Red Cow Has an Answer | Have you eaten? written by have you eaten? To be or not to be a meat eater, that is the question. Right? I was vegan for a while and was pescetarian until October 2014. I was vegan when living in Atlanta, which I was eating vegetables, fruits and grains. When I moved back to Seattle in 2008, I just added seafood to my vegan diet. But I was vegan and pescetarian not because of animal cruelty, wanting to reduce CO2 emissions or wanting to save the world eventually or anything like that. My body got used to vegan diet for a while so every time I tried to eat meat products, I didn’t feel well afterwards so I just avoided for a long time. In October 2014, I traveled to Paris with Archie, my best friend. The trip turned my world upside down. I wanted to taste EVERYTHING that Paris had to offer. Beef bourguignon, beef tartar, pork rillettes, lamb, quail, baguette and butter (of course, French cuisine is not complete butter!) My stomach felt a little funky at first but slowly I have gotten used to eating meat. 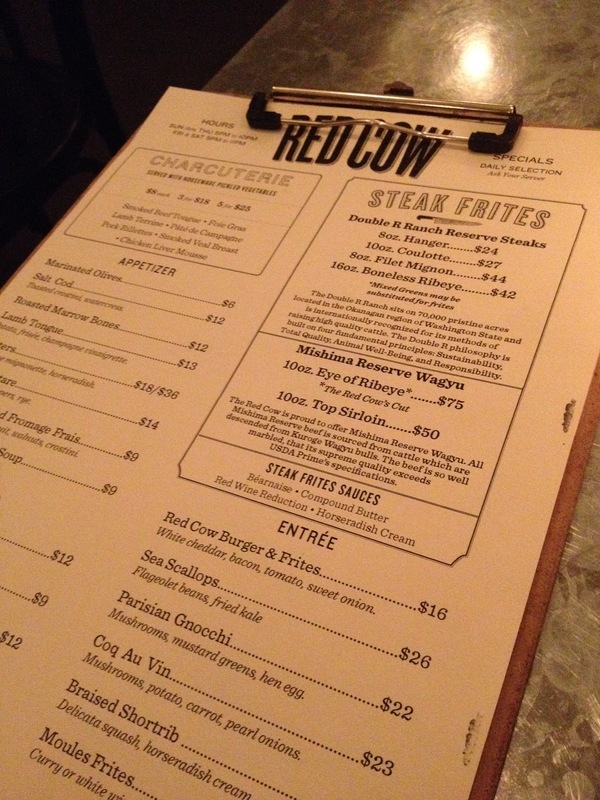 So, this is one of Seattle’s be-loved chefs, Ethan Stowell’s 9th restaurant called Red Cow. It is located in this quaint Madrona area in Seattle near Lake Washington. They change menu seasonally, which I respect and admire so much. We shared smoked duck breast, beef tongue, pork rillettes as charcuterie plate and the plate was more than excellent. They had so much flavor and melted in my mouth. Smoked meat can be tricky sometimes but this one was quite tender and had a very unique taste. They offer 16oz Rib Eye. Yes, 16oz. I kind of wanted to try to be honest just to see how ridiculously big that was but I didn’t want my heart to stop next day either so I decide to have 8oz Filet Mignon. It was superbly prepared (well, for my taste, medium rare) and inside was perfect reddish pink with crunchy fries and lots of homemade butter! What a divine plate of Steak Frites. When we were seated, we told our waiter “We are vegans. What can you do for us?” “We have tons of lettuce,” he replied. I like witty and smartass people. I consider Red Cow is doing something right by offering excellent healthy and well-taken care of animals and hiring experienced smartasses. Just to mention, if you are vegans, vegetarians, or pescetarians, or whatever diet method you are using, Red Cow is not the place for you. At all. But if you are meat-eater, flexitarians (I can’t keep up these names anymore…have you heard kangatarian; vegetarian diet plus occasional kangaroo meat consumption? ), you would appreciate this place very much. To be or not to be…is not a question for me anymore. Previous PostRight vs. Wrong: Who Decides What Freedom is for people?